For Mac users, they may have trouble figuring out the best Mac OS video converter as smaller number of best video conversion software for Mac is available than that for Windows. Considering this, here we list top 10 best video converter for Mac (El Capitan/macOS 10.12 Sierra) that is able to convert video on Mac in UHD/HD with fast speed without losing quality. MacX Video Converter Pro - First Mac video converter supporting Intel's QSV hardware acceleration to accelerate video conversion speed up to 5X faster than any rival. It makes it easy to convert SD & HD videos to MP4 MOV MKV AVI MP3 AAC iPhone Ringtone 180+ video and 14+ audio, plus 420+ profiles offered! MacX Video Converter Pro is a professional video converter for Mac which has 320+ video and 50+ audio codecs to convert among all the video formats like MKV, MP4, AVI, MOV, WMV etc on Mac (MacBook, MacBook Pro/Air, iMac etc) in 4K UHD/HD 1080P/720P for playback on 410+ mobile devices like iPhone X/8/7/6s/6/Plus, iPad Pro/Air 2/mini 4, Galaxy S8 etc. with world's fastest speed and no quality loss!! 1. Support wide range of video formats in 4K UHD/HD/SD. 2. 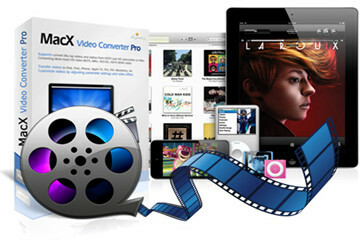 Convert any videos to 350+ hot iPhone iPad Android devices. 3. First video converter for Mac that use Intel's Quick Sync Video hardware acceleration tech to provide the world's fastest Mac video conversion speed (5x fasters than others). 4. Bonus advantage to free download any video/movie/music from 1000+ sites. 5. Other features like video editor, camera/screen recorder, slideshow maker. 1. It will be better to integrate DVD ripping function. Aiseesoft Video Converter for Mac is another best video converter Mac tool that handles with a huge number of formats like AVI, MP4, MOV, MKV etc in HD. It also helps to convert video on Mac devices (El Capitan) for numerous portable devices like iPod, iPhone, Apple TV, PSP etc. This Mac OS video converter features an highlight of converting videos from 2D video to 3D with multiple 3D options. 1. Convert among a huge number of videos formats on Mac. 2. Turn 2D video to 3D with multiple 3D options. 1. Several popular video formats are not supported, such as FLV. 2. Users will have to upgrade to the Ultimate version to get the online video download feature. 3. Good HD video converter for Mac but with no 4K UHD support. Handbrake is among the free video converter for Mac for Mac OS users. Handbrake is better known as a free DVD ripper which is well received among users. In fact, Handbrake also works as one of the best Mac video transcoder freeware to transcode multiple types of video files into MP4 or MKV for Android, iOS devices, or other devices and players. It's 100% free, and the output quality is also acceptable. 1. It's a free Mac video converter. 2. It integrates DVD ripper into one. 3. Convert video on Mac with fast speed and good quality reserved. 1. It outputs in MP4 and MKV only. 2. It's complicated and troublesome to download libdvdcss on Mac 10.11 El Capitan/macOS Sierra. 3. Incapable of downloading online videos. iFunia Video Converter for Mac is an excellent Mac video converter to convert SD/HD videos on Mac (El Capitan) from/to numerous video/audio formats including AVCHD MTS, M2TS, H.264/AVC, HD MOV, AVI etc. It allows users to convert videos for various mobile devices. It also accepts DVD files like a DVD ripper to convert DVD VOB, ISO image to common digital audio video formats. 1. Support wide-range of HD/SD video formats. 2. Convert videos in any format into 3D. 3. Able to convert DVD files. 1. Lack some extra functions like the ability to download videos from online sites. 2. Some hot devices like iPhone 6S/6S Plus are missing from its support list. 3. No 4K UHD video support. If you're looking for the best free Mac video processing software, MacX Video Converter Free Edition is also a good choice. This video converter Mac freeware works seamlessly on Mac OS X El Capitan to convert among 8K/4K UHD, HD 1080P/720P, SD videos between AVI, MPEG, MP4, DivX, XviD, MOV, FLV, RM, RMVB, WebM, Google TV etc with fast speed and superb quality. Also number of useful editing options are available. 1. Support wide range of video audio formats. 2. Accepts 8K/4K ultra HD, HD videos. 3. Video editing and slideshow making is a bonus. 4. Fast video converting speed and good quality reserved. 1. Limited functions without extra features like online videos download. After video converting process is finished by mac video converter, you're allowed to apply the world-class MacX MediaTrans to transfer videos from Mac computer to mobile device (iPhone iPad iPod Android, etc.) now. With advanced Intel QSV support, it enables you to sync video from Mac to mobile device with seconds only, 140 seconds for 396MB MKV video transfer. Photo, music and movie backup also supported! Movavi Video Converter for Mac is among the best Mac video encoder for various popular formats like AVI, MP4, 3GP, FLV as well as MP3, WAV, OGG, AAC etc. You can easily convert video on Mac for more than 200 devices such as iPhone, iPad, Samsung Galaxy, Google Nexus, Sony PlayStation, Microsoft Xbox, and Android powered phones and tablets. 1. Support wide-range of video formats in Full HD/SD. 2. Convert videos to 200+ mobile devices. 2. Other features include DVD ripping, video joining, batch processing, soundtrack extraction and more. 3. Fast Mac video conversion speed without noticeable quality loss. 1. The Windows version of this Mac OS video converter hardware acceleration tech, but the Mac version is out of luck. 2. It's light on extra features such as DVD burning and the ability to download online videos. ImTOO Video Converter for Mac comes as one of the best HD video conversion software for Mac (El Capitan fully supported). This Mac video converter can easily convert among HD/SD video audio formats like MKV, MTS, HD WMV, MP4, AVI etc for the hot devices including iPhone 6S/6S Plus/6/6 Plus, Apple TV, iPad, PSP, PS4, BlackBerry and more. It also supports video conversion on Mac from 2D to 3D and 3D to 3D. 1. Support wide-range of video audio formats. 2. Support video conversion to popular mobile devices. 3. Convert 2D video to 3D movies on Mac computer. 4. Rich video editing features. 1. Lack extra functions like downloading videos from internet. 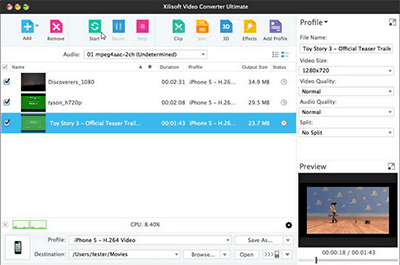 Xilisoft Video Converter Ultimate for Mac is a multi-functional Mac video processing program for OS X to satisfy the needs of HD/SD Mac video conversion. It can convert virtually all video audio formats like AVI, MPEPG, WMV, MP4, MOV, FLV etc in HD/SD resolutions for playback on iPad, iPhone, iPod, PSP, Zune, mobile phones more. It also supports the conversion from standard videos to 3D videos. 2. Support 2D & 3D video conversion. 3. Rich video editing features like edit, clip, merge, crop etc. 1. There is no Subtitle options. 2. The interface is not so explicit. 3. Too expensive for its limited functions (no extra features like internet videos download or DVD support). Leavo also brings one of the best Mac video transcoder. The Mac video converter converts video/audio between 180+ formats for iPhone iPad, Galaxy S8 edge, HTC 10 and other mobile devices. A bonus feature is to convert video on Mac (MacBook, MacBook Pro, MacBook Air, iMac etc) from 2D to 3D in any formats, with 6 different 3D modes available. 2. Convert 2D video to 3D movies on Mac computer. 3. Fast video converting speed on Mac with zero quality loss. 1. Not work on the latest macOS High Sierra. 2. Limited functions without extra features like online videos downloader, video recorder etc. 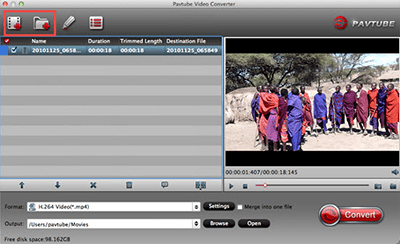 Pavtube Video Converter for Mac will also win a spot in the best Mac video converter review as it can convert any SD/HD videos like AVI, WMV, MP4 etc to various common audio/video files for mobile devices, media players, game consoles, as well as for editing programs (e.g. Final Cut Pro, Final Cut Express, iMovie, Avid, Adobe Premiere, etc. Besides, it allows personal video movie creation with rich editing features. 1. Wide range of input and output video formats/devices. 2. Support convert videos to various editing programs. 1. Lack the ability to download online videos. 2. Some popular hot devices like iPhone 6S/6S Plus are missing from its support list.